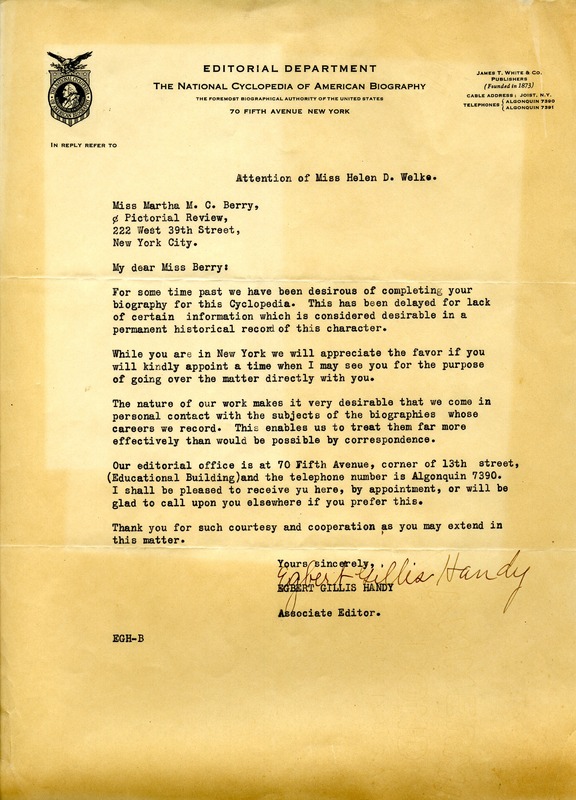 Egbert Gillis Handy, the associate editor of the National Cyclopedia of American Biography, would like Miss Martha Berry to schedule an appointment with him. The editorial office he works for is earnest to complete Miss Berry's biography for the cyclopedia, and he finds it most desirable if they both meet in person. Mr. Egbert Gillis Handy, “Letter to Miss Martha Berry from Egbert Gillis Handy.” Martha Berry Digital Archive. Eds. Schlitz, Stephanie A., Monica Langmeyer, et al. Mount Berry: Berry College, 2012. accessed April 21, 2019, https://mbda.berry.edu/items/show/8516.